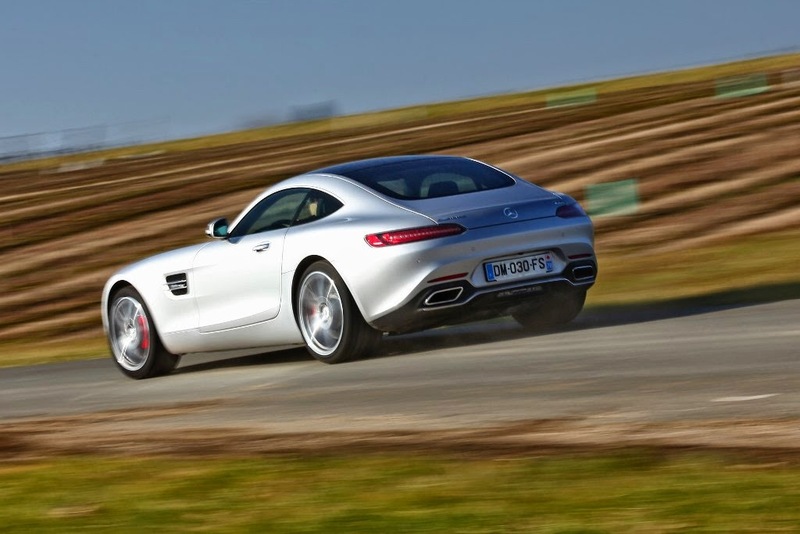 Mercedes AMG GT S. This is the story of a little boy avid sports cars. In the evening, he lets his musings outweigh the winding track and a wonderful desert circuit. He flies his favorite race car, the one that haunts his nights and feeds his fantasies, I named the Porsche 911. Suddenly a gaping grille pops up in the rearview mirror. She proudly displays the three-pointed Star which never constituted a serious threat. Porsche will outrun in no time. Not this time though. Because the intruder is called Mercedes-AMG GT S. It is the enemy. Presumptuous rival. The GT S approaches to hound the 911. Nervous young fanatic stirs under the duvet: swollen the superiority of his car, he can not believe that Mercedes has the audacity to mine overtake. A moment later, it's done. The boy wakes up with a start and if it was a premonition? People from Mercedes-Benz and AMG ask nothing better than to convince us that the nightmare of Porsche has finally become reality. They do not would show such serenity if they were some of the qualities of their new car. Paid for us to evaluate. We must face the facts. Like it or not, the 911 serves as a yardstick for fifty-two years in all sorts of sports cars from the coupe designed for rapid tourism (the base Carrera) to the fireball that sacrifices very performance (GT3). We measure the strength of the 911 myth remembering that it is at once the most controversial sports car and one that ultimately win over as many of his detractors. The 911 has that talent to its unique mechanical architecture, heresy on the balance plan that guarantees however, improvements in strength, a high level of performance combined with some versatility. Even the most powerful 911 boasts comfort and roominess than competing supercars struggle to match. It was necessary that there is an advantage in having all its engine in the rear! Although it has long since given up the ultra-compact suspension torsion bars, modern 911 still has a decent boot volume. Above all, it has never parted with his pair of spare seats. Over the years, they helped bury more of a rival rear mid-engine, more modern and more uniform but less roomy. The elders of the adventure of the Sports Car Manufacture (MVS) readily tell that premium Porschistes seduced first by the Venturi turned back when they later discovered that he had to open a small chest of difficult access to file briefcase and jacket. Hard. Like other rivals declared the 911 before it, the Mercedes-AMG GT will have to comply with sometimes conflicting demands of a clientele that demands style and performance as well as comfort and versatility. If she ignores the rear seats, at least she has a trunk of easy access, ample capacity to carry two golf bags (285 liters against 125 liters only for 911). The opposite would have been unacceptable in the eyes of US customers. Established on fire base coupe Mercedes-Benz SLS AMG (2010-2014) it does not officially replaces the Mercedes-AMG GT S is based on a shortened wheelbase of 5 cm and weighed about 80 kg less on average . On the road, she demonstrated a speed and a formidable efficiency, which is explained by the extreme rigidity of the hull and the careful distribution of the static load (47% on the front axle). Delivered into the hands of our colleagues in the American press on the Mazda Raceway Laguna Seca, the GT S is easily reached lap times similar to those of the Porsche Cayman and the Porsche 911 Carrera S. A highly efficient machine. Question chills however, the Mercedes-AMG GT S lets the driver somewhat unsatisfied, and ungrateful as pretentious as it sounds. He is surprised to be regretted that the natural balance of the GT S and the disconcerting ease with which it oozes out of tight corners gum too the feeling of speed. The grip level is such that it allows itself to go around without worrying whether the road is banked or not, dry or moist. It turns and crushes the accelerator, that's all. Looking like that can reasonably afford to adopt in open country, driving the Mercedes-AMG GT does not claim any special talent or precaution. 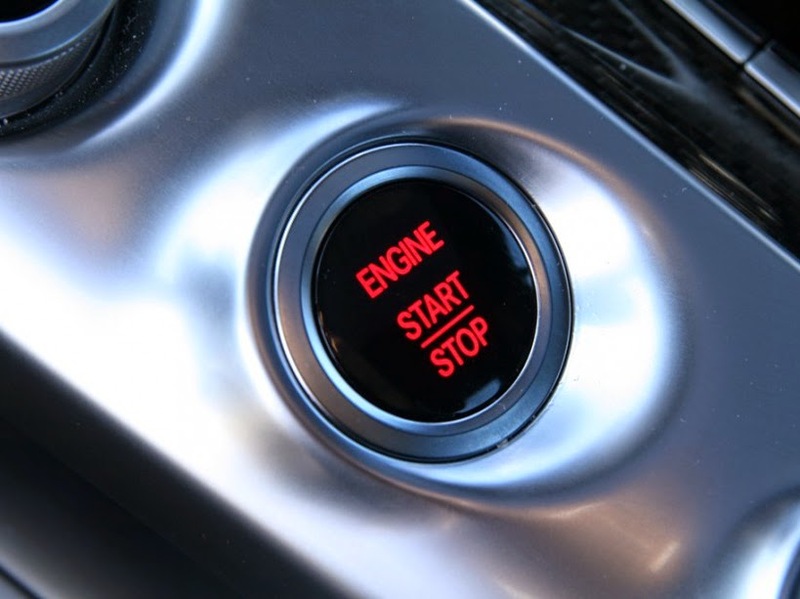 There are no instructions to assimilate: no need for example to ensure enter cornering load on the brakes to the front or delay the overshoot. Without being noticed, the trajectory correction works with the limited slip differential to help the car rotate, contain any spills and provide the illusion of ease to a lambda driver. A sacred success. Pilotage fans however will think twice before giving up their Porsche 911 GTS, or even their Jaguar F-Type. Provided they would be wrong to bury the coupe Mercedes-AMG GT: its designers suggest that a declination Black Series - even a more powerful and sportier yet - will handle hold a candle to the 911 GT3. We look forward to taste it. Explosive, the AMG V8 lives well his conversion to twin turbo. The V8 twin 510 horsepower supercharger pushes hard, very hard. The figures of 3.8 seconds to go from 0 to 100 km / h express only very imperfectly panic needles counters and violence acceleration when crushed the right pedal. Particularly in the "Race" mode that allows the pair of clutches to give Klitschko a few jerks, serving sensations and lap times. Ever this DCT seven-signed Daimler did seemed to hesitate between two reports. In automatic mode, the selection proves fast, fresh and relevant. So the sequential manual mode can actually be limited to use on circuit. The couple offered by 3.982 cm3 (650 Nm from 1750 to 4750 rev / min) than enough to erase the response time of the two turbines, if any. Their discreet whistle quickly covered by the noise of the exhaust and rolling. Particularly by the latter, far superior to what Porsche had accustomed us. Ergonomics upset. When opening the door of the GT (articulated on conventional hinges not on the house), one is amazed by the size of the center console. Oddly, it seemed less large photographs. Its imposing size gives the impression of a more narrow cabin it actually is. Fortunately, it does not encroach on the space devoted to the right of the driver knee. This sits well back, as close to the rear axle. It's good for the driving experience, a little less for comfort. Amortization very relaxing flanged rear strikes blows racket, even "Comfort" mode. Mercedes-AMG we regret that did not choose to better distinguish the damping laws piloted in the image of what Porsche. Some of our colleagues have even ventured to profess that the 911 GT3 better preserved their lower back. Very remote, the driver is also shifted to the left, in a surprisingly wide cockpit. Mercedes-AMG GT extent indeed against 1.94 meter wide 1.85 meters for the Porsche 911 Carrera S and 1.88 meters for the Chevrolet Corvette Stingray, more reasonable in this respect than its predecessors. This is the Mercedes-AMG inherits its predecessor central location before his engine with gearbox rejected against the differential on the rear axle. Although officially shorter by about 9 cm as atmospheric V8 it replaces, the new twin-turbo engine encroaches heavily on the cockpit. Hence the huge center console. Still, it is easy to find a comfortable driving position aboard the Mercedes-AMG GT, although it is regrettable that the steering column does not back further. The driver pestera too far back against the implementation of the control lever of the robotized gearbox with double clutch. It is rumored that this location was dictated by the insistence of US customers to have two large cupholders hand. Rather than the elbow. Of all these buttons, our favorite is the one located at the bottom right. It has on our brain neurotic the same effect as that of a candy bar on laboratory mice: very quickly you get used to actuate to get our dose of fun. 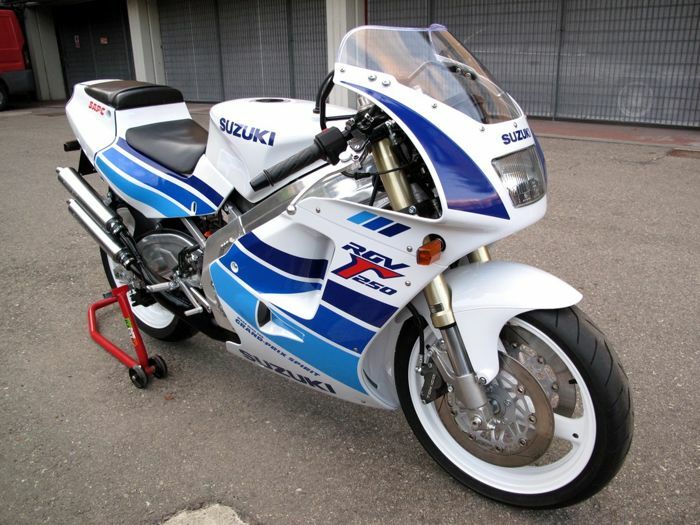 A pressure sufficient to free the voice of the engine and enjoy the barking of the exhaust. The boss Tobias Moers AMG is proud to state that prohibited any use of systems - very fashionable - amplification or sound simulation. No sound synthesis on GT S: the rumbling idle and at high speeds metal art are those of the V8, along backfiring in "Race" mode. In town, dirty kids that we take pleasure in turning the heads of passers-by. This hardly costs us since it is possible to set silent on their most loquacious fashion while maintaining the damping position "Comfort". The GT S is not the queen of cities. The overall width of the GT S implies a habituation period, especially in cities where the vast hood double bubble seems to hide the three meters above the ground the car. Result, the pilot gradually enhances the seat of his chair, even sacrificing the ease with which it takes place in the excellent bucket seats, under the vast glass roof. Station to back strain! 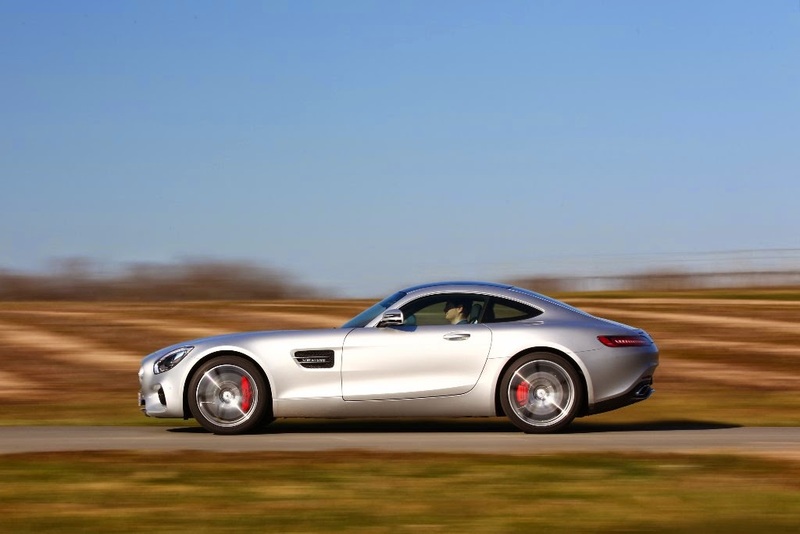 Despite these minor defects in a sports car, the Mercedes-AMG S GT proves to be a very livable craft daily, shorter and more manageable than the SLS AMG. In town, however, the driver pestera against the lack of return of the steering forcing to support the online delivery of wheel movement. Same yaw output, where it is appropriate to adopt the academic position of the hands on the steering wheel to avoid swerving and chaotic trajectories. That's not the biggest criticism that can be formulated against this direction with the assistance does not decrease with speed enough for our taste. Light and delightfully direct in town, it is a little too bright in a straight line where it runs at high speed of a balance as soon as the road movement deteriorates. This phenomenon would not be embarrassing if the driver had armrests at the right height, as on the 911. Even the damn console too wide! Note that our test GT S did not benefit from the Direct-Steer specific sport Dynamic Plus Pack AMG deemed "optimize the transmission of longitudinal and transverse forces" in the steering wheel. Playing with different driving modes (standard on GT S, optional on the GT which will be released in July 2015) unfortunately too few improves the consistency of management. Mercedes-Benz S GT, from 144,000 euros. Budget side, the Mercedes-Benz S GT does not curtail her attire even if it lowers the entry ticket compared to its predecessor SLS AMG. With 510 horsepower and a price of 144,000 euros, it is between the 911 and the 911 GTS Turbo (click to check prices and Mercedes-AMG GT options). As time Sir William Lyons however, the best ratio of price, performance and pleasure is to find next door Jaguar, with F-Type. 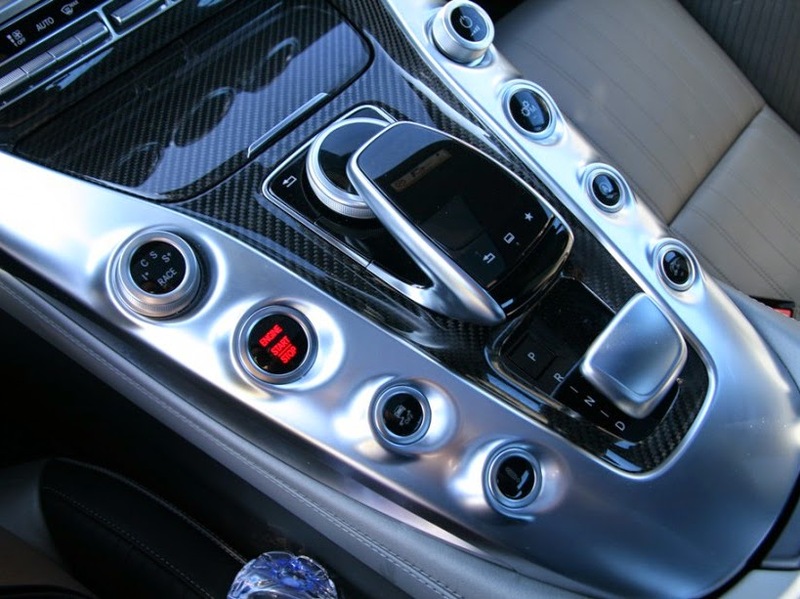 Not surprisingly, the list of options and the Mercedes-AMG GT S customization accessories simply proves stunning. As for consumption, if it officially at 9.4 l / 100 km on average, we found the figure of 15.1 l / 100 km after a test day. Great indeed is the temptation to seek AMG V8 so well with the Mercedes-Benz dual clutch transmission. An all-new twin-turbo V8. Code Name: M178. Officially, the M178 engine of Mercedes-AMG GT is the first designed independently by AMG. A closer look, however, the engine did not start with a completely blank sheet. 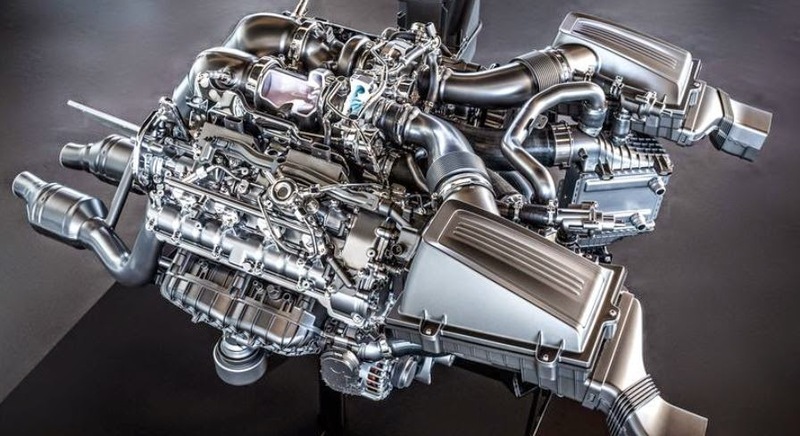 The 3,982 cm3 V8 that correspond to eight times per cylinder 4-cylinder 2.0 turbo "square root" of the Mercedes-Benz CLA 45 AMG. Clever. The twin turbo V8 M178 swapped some noise charm of the old M156 / 159 air against an overdose of torque and power, available later in the towers. For the first time in the German manufacturer, the two BorgWarner turbines are arranged in the hollow formed by the two cylinder banks (Anglophones speak of "hot-V8") in the manner of what is done at Ford, BMW, Audi and Bentley. The advantage of the shortened intake pipes is twofold: less thermal losses and a short response time. In return, the turbos overheated demand a specific arrival fresh air that works even stopped. And they increase the size of the motor in height, despite the presence of a dry sump lubrication of slim. Look no further reason for the height of the hood of the Mercedes-AMG GT. Engine and exhaust sound to die for. Room for two. For only two with luggage. Box fast double clutch, soft and relevant. More affordable than the SLS AMG. Easier to live ausi. The less limited field of view by the huge hood, very high. Gear lever and center armrest down too. Amortization too dry in "Comfort". Too light at high speed direction; too isolated from the road.